Conventional touch-trigger measurement methods rely on speeding up the motion of the CMM’s 3 axes to measure quickly – PH20 utilizes the head motion technology developed for the multi-award winning REVO system to minimize the dynamic errors of the CMM at higher measurement speeds. PH20’s unique ‘head touches’ allow measurement points to be taken by moving only the head, rather than the CMM structure. Points are taken faster, and with improved accuracy and repeatability. 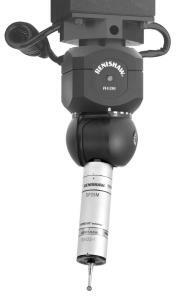 The 5-axis motion eliminates time spent indexing the head. Together these speed increases result in a 3-fold improvement in throughput over conventional systems. PH20’s infinite positioning capability guarantees optimal feature access, minimizing stylus changes. 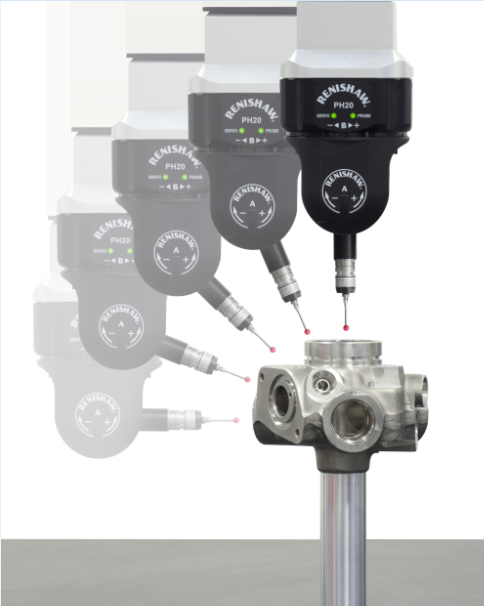 The 5-axis simultaneous motion allows larger parts to be measured on the CMM by reducing the space required around the part for head rotation. PH20 automatically aligns itself with the part coordinate system, avoiding stylus collisions and the requirement for accurate fixtures. The PH10 PLUS family comprises the PH10M, PH10MQ, and PH10T. They increase throughput by giving automated CMM’s the added capability of program controlled probe re-orientation. Each PH10 can carry a range of probes and extensions and can be orientated in 720 repeatable positions, giving access to the most difficult-to-reach part features. This enables the inspection of features at different angles without the need for frequent, time consuming stylus cluster changes. All three variants of the PH10 PLUS heads are supplied with a repeatability specification of just 0.4 µm (2σ) (specified at a distance of 100 mm), giving users improved positioning at the stylus tip. In 2010 after some design enhancements, their industry standard family of PH10 motorized indexing heads have a 20% improvement in repeatability and increased long term stability. 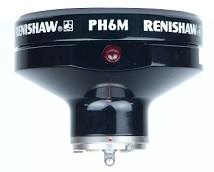 The PH6 is a small diameter fixed probe head with an M8 threaded probe mount with integral cable. The PH6 is suitable for use with TP2,TP20 and TP200 Touch Probes. 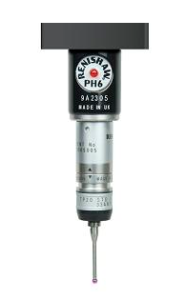 The PH6M is a fixed head with autojoint connector for probes and adapters, which is compatible with multi-wired probes TP7M, SP25 and SP600M as well as the complete Renishaw touch probe range through the use of the PA series of autojoint adapters. MH20 is a manually adjustible probe head with an integral TP20 kinematic stylus module mount. It features an ultra compact design to maximize CMM working volume, an infinitely adjustable orientation to optimize access to complex parts, and is pre-fitted with a customer-specific shank to suit the customer’s CMM. TP20’s compatibility ensures that a wide range of stylus configurations are easily interchanged – enhancing flexibility. Fast and repeatable stylus module changing further improves productivity. This manual indexing probe head combines the TP20 kinematic stylus module mount with two axis indexing, enabling flexible stylus changing and reapeatable probe re-orientation. 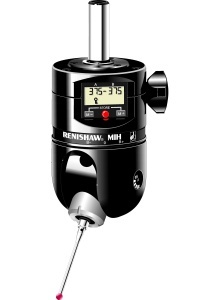 The MH20i compact probe head offers the significant advantage of repeatable indexing positions, vastly improving productivity for multi-orientation measurement applications. Ideal for use where several probe/stylus configurations and head positions are required to enable the comprehensive measurement of a part in a single routine. 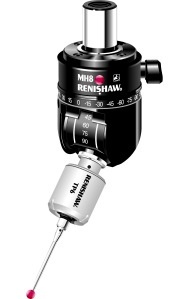 Other features include MH20i’s repeatable index positions which eliminate the need for constant re-qualification, 168 positions (at 15° increments) offering maximum flexibility in repeatable probe orientation, lock/ unlock features allowing ease of positioning and eliminates unnecessary wear, and easy-to-read scales for raped re-orientation to qualified positions. The MH8 is a manually adjustable indexing probe head with M8 thread allowing use of TP2, TP6 or TP20 Touch Probes. It is compact, designed for use on small manual CMM’s – most suitable for use on manually operated CMMs or on smaller DCC units where numerous probe indexes are not required to be carried out automatically. The CMM operator need only to qualify the required probe positions once during setup. It also features repeatable indexing in 168 positions in 15° steps. The MIH is a versatile manual indexing probe head that can repeatably index in 720 positions in 7.5° increments. Its integral LCD enables easy programming of probe orientation positions – and up to 20 positions can be memorized. MIH also includes an autojoint probe mount for fast and repeatable probe changing. MIH is capable of carrying up to 300mm (11.81 in.) extension for deep part measurement.